10 & 20 Ft Segue Custom Modular Hybrid Displays: Silicone Edge Graphics is a whole new line of hybrid graphic applications called Segue used in conjunction with custom modular hybrid displays. Why is SEGUE such a big deal? Other applications in the market today rely on velcro to either attached the fabric graphic to a aluminum extrusion or wrap around and secure in some other manner. SEGUE attaches graphics with an aluminum extrusion that accepts a bead of silicone that's sewn onto the fabric. The initial response for this new graphic system has been positive enough that one could easily see that suppliers of exhibit display products, will let this new technology bleed over into other product applications. 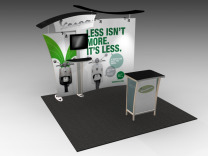 The task of serving our clients who are looking for trade show displays is an vital roll in our trade show exhibit business. It's not acceptable to accept an order, pull it, and get it out the door via any of the automated means that we have access to today Even though time sometimes runs out, we have to be ready to step back and make the time to walk our clients through their purchases, which will create the good will that will continually bring them back as repeat customers. Our goal at ShopForExhibits is to provide the direction necessary to our clients so their exhibiting experience will be as valuable as possible to both them and their company. 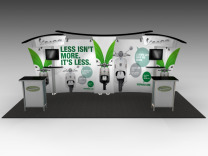 Nothing is quite as sure as change, which is why having a trade show display provider like Classic Exhibits has enabled so many distributors weather the difficult economic times through the development of so many new high demand products. What did Classic see that gave them the inspiration to forge ahead during uncertain times to create new marketable products? They happen to notice that certain aluminum shapes that they'd been purchasing at that time, had a significantly lower cost per linear foot in comparison to others, and concluded that those shapes should be taken into account for future product development. With the help of a creative staff and a solid vision of the future, they've been able to introduce to market, a series of well received new lines of custom modular hybrid displays. You may have been aware of some of the exceptional new lines that Classic Exhibits developed recently, starting with the Perfect 10 and Magellan Miracle tension fabric display systems, followed up with the Sacagawea custom modular hybrid display system. At this moment, Classic is being very aggressive in the market in comparison with other producers of trade show exhibits, which has put them in a leadership position where they will be well prepared to be a market leader as they head into the future.